Loftus was an outstanding factory worker who had mastered complex engineering skills in a very short space of time and Knight was commissioned to paint her at work in the factory. Knight was fascinated by circus artistes and dancers, and she emphasises the balance and posture of her subject at work. 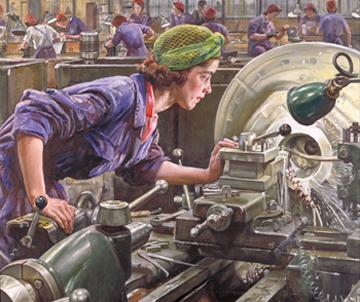 Industrial machinery was a wholly new element in Knight's work but her technical accuracy was praised in contemporary reports: Knight, like Loftus, was proving herself in a traditionally male environment.